This detailed map covers the area immediately east of Croydon. Part of Addiscombe, including Addiscombe Farm, is in the NW corner, Coombe Park and Coombe Farm in the SW. The rest of the map is quite rural and includes the village of Shirley, including Upper Shirley, St John's church, Pole Wood, Shirley Park, with coverage extending eastward to Swiss Lodge. 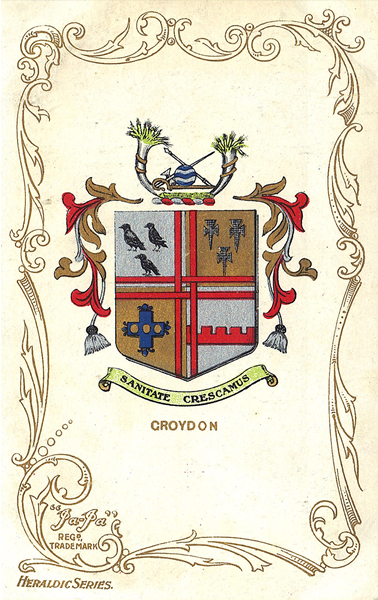 There are street directory entries on the reverse for Ashburton Road, Clyde Road, Outram Road, Shirley Road and Spring Park Road, together with a railway timetable for the Woodside-Selsdon Road line in 1908. You might find this Index map useful. The map links up with Surrey Sheets 14.07 Croydon Woodside to the north, 14.10 Central Croydon to the west.